...but it is the first time the entire movie was shot for theatrical release. In 1964, spies were the hot pop culture commodity thanks to the runaway success of Sean Connery's James Bond films Dr No and From Russia with Love. Hoping to capitalize on the fad, all three TV networks demanded series pilots featuring spies. 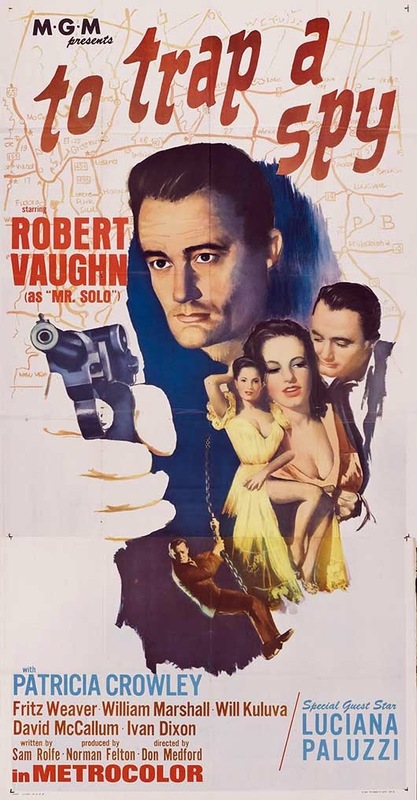 MGM's entry was Solo, starring Robert Vaughn as U.N.C.L.E. agent Napoleon Solo. along with David McCallum in a minor role as agent Illya Kuryakin. NBC liked it and bought the show, but demanded several changes, including retitling the show. The pilot aired as "The Vulcan Affair", with several minor changes including reshooting all the scenes with the head of U.N.C.L.E., who was recast, and dubbing "THRUSH" into everyone's dialogue to replace "WASP" as the name of the badguys' organization. One other note: "The Vulcan Affair" was broadcast in black and white (as was the entire first season of the show) since most American households still only had b/w TVs! To recover costs for the expensive pilot, MGM shot several additional scenes with actress Luciana Paluzzi as a WASP agent trying to seduce and kill Napoleon Solo to get the running time up to about 90 minutes and released the finished film as To Trap a Spy! You'll note there's no mention of "U.N.C.L.E." on the poster, since the show hadn't aired outside of the US at that point, so it was promoted as a Bond-like spy pic! ...which mentions, at the very end, the tv series as the basis for the movie. It did moderately-good box office overseas, which resulted in another theatrical release, which we'll show you...tomorrow! I'm not too impressed by the trailers for the new movie - the film doesn't look like a serious spy thriller, which is a mistake in my view. The first season of TMFU was played straight, and the more camp that later seasons became, the worse they got. The camp fad also influenced other spy-fi and sci-fi series: Voyage to the Bottom of the Sea, Lost in Space, Wild Wild West, and The (Steed & Mrs. Peel) Avengers. 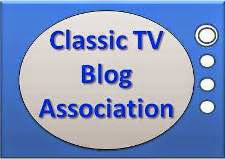 Those shows started as straight action-adventure, then got sillier and more juvenile in 1966-67. Then they tried to tone it down in '67-68, when the camp fad passed. To Trap a Spy aired on TCM a few weeks ago, and the host mentioned that David McCallum had only a small part, because Illya was originally just a secondary character. Before long, of course, McCallum became very popular with teenage girls (and probably with their mothers, too) and he was promoted to co-star. I didn't know Luciana Paluzzi's scenes were filmed specifically for the movie; I thought it might have been compiled from "The Vulcan Affair" and another TV episode. (IIRC, she was in "The Four Steps Affair.") But her scenes in To Trap a Spy did have more graphic violence and sexual suggestiveness than was usually allowed on American TV in the 1960's. The new movie is a disappointment if you want one more episode of the TV series. It is a reboot, and it makes a lot of changes. I particularly disliked how Illya was portrayed. But, judged on its own merits, it is a not-bad spy thriller. There is a lot of tongue-in-cheek comedy relief, but I wouldn't call it camp. In its style and tone, I would compare it to the 1960's James Bond movies and the first two seasons of TMFU, rather than to the Batman TV show or the Matt Helm movies.